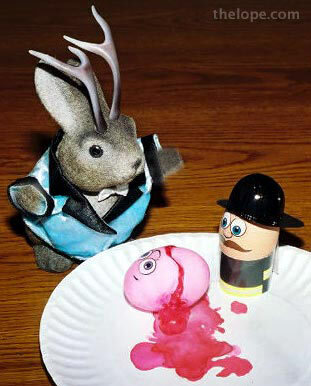 On this day of torn colored cellophane, please click here and take a moment to honor the memory of those who fell in the Great Peep Uprising of 2006. 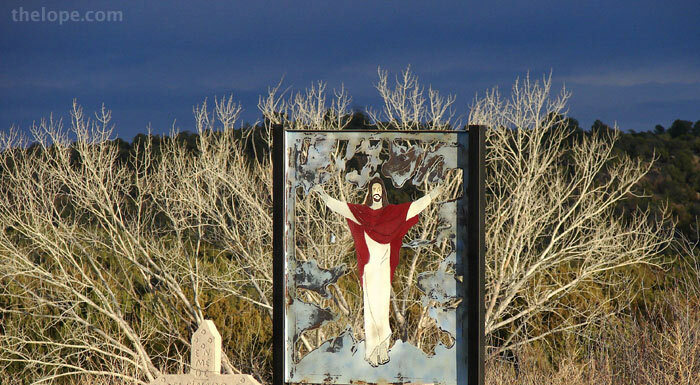 Yes, someone actually named their mini-golf course after the hill upon which Christ was crucified. 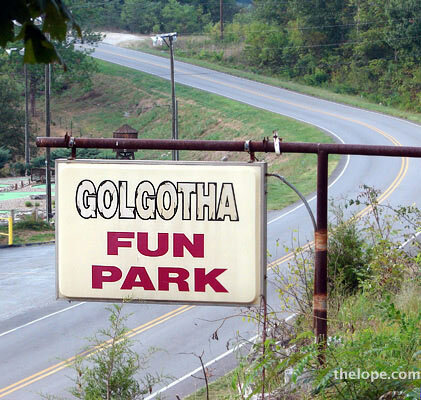 Visit Golgotha Fun Park..
Easter - a time of Spring and renewal...what a lovely time to think about death. 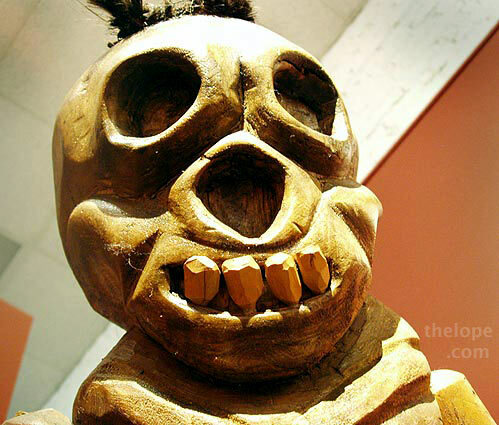 Read about Doña Sebastiana in Death Cart. Better yet, go visit her at the Hutchinson Art Center. Please enjoy this Easter egg tree in Joplin, Missouri. One of my hobbies is documenting animated store window holiday displays. 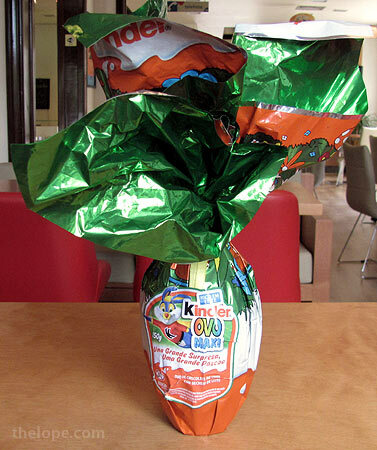 Here are a few motorized Easter automations. 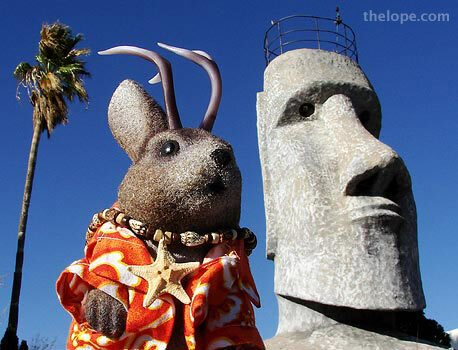 It's been a tradition here to run photos of Easter Island moai on Easter. 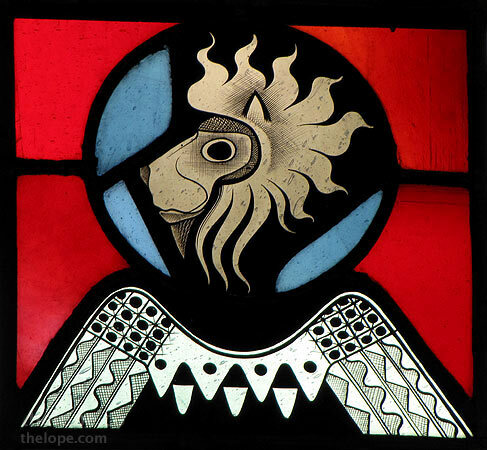 Please enjoy Happy Easter Island and More Easter Stuff. 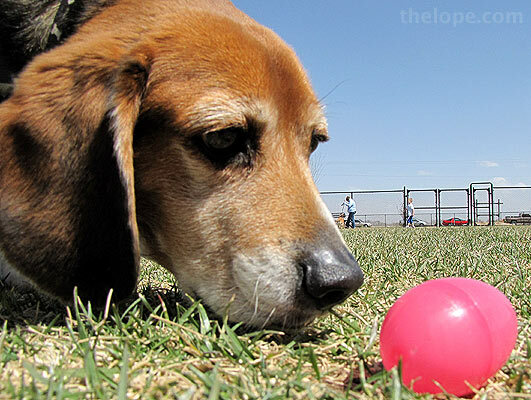 One of Hutchinson's cooler Easter traditions is Doggone Easter Egg Hunt at the Hutchinson Dog Park, 1501 South Severence. Here's 2009's event. 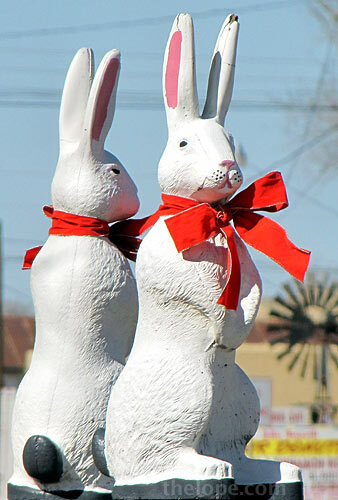 These Texas bunnies wore what was probably left over Christmas ribbons but I thought they looked good for Easter. The folks on the northwest corner of 30th and Adams streets in Hutchinson, Kansas, often decorate their metal buffalo for holidays. 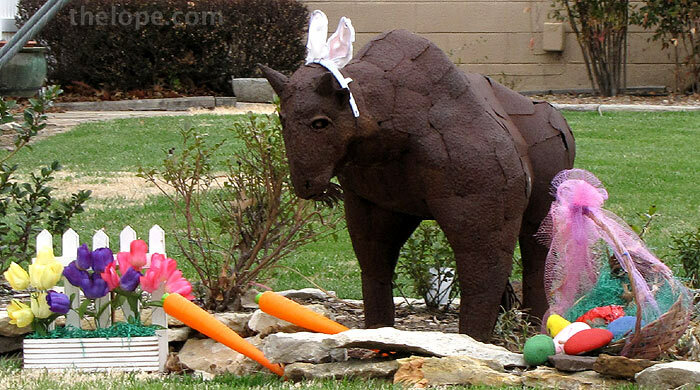 This is their 2009 Easter Bison. I hope your Easter eggs coloring went better than did Ace's. This is an early 17th century German (probably Bavarian) ivory crucifix in the Phoenix Art Museum. 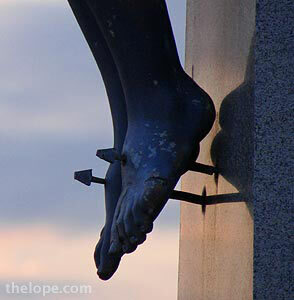 The artist is unknown and the cross and nails are modern. 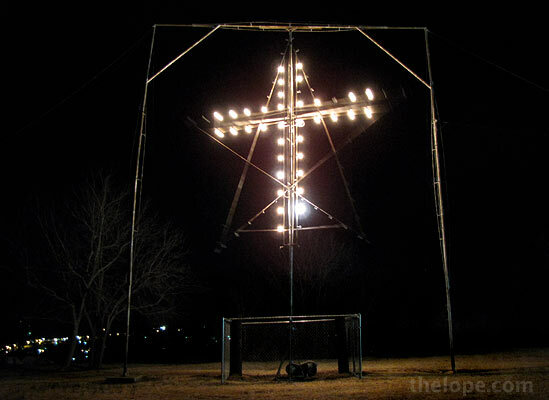 The city of Fredonia, Kansas, has an illuminated framework on a hill that can be used as a star at Christmas or a cross at Easter. 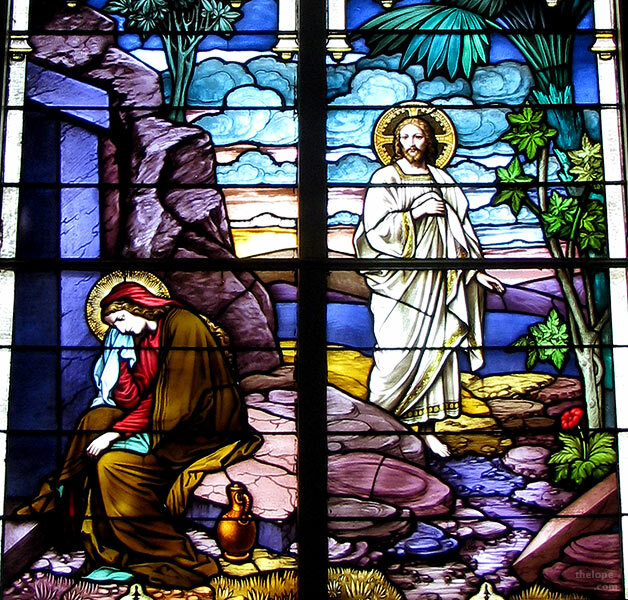 Here is a detail from a window of St Teresa Catholic Church in Hutchinson, Kansas. 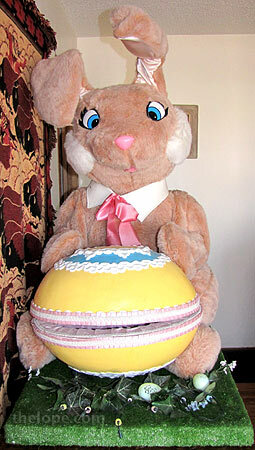 Two Easters ago, I was greatly relieved at the news that Patsy Terrell did not have cancer. 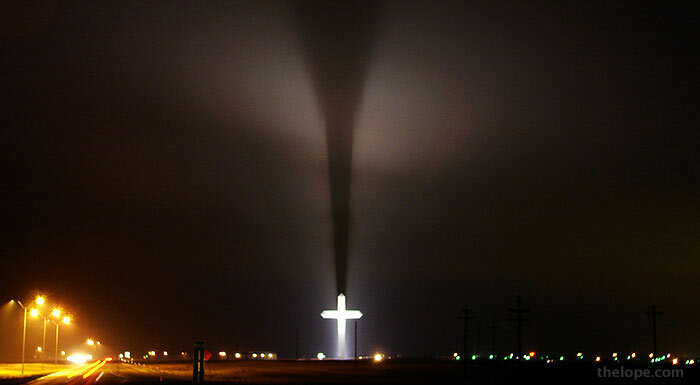 She'd been hospitalized in Wichita's Via Christi hospital, which has a wondrous chapel at its core. 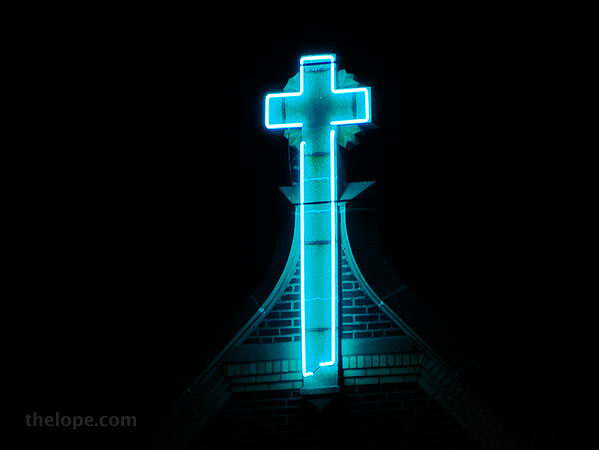 I stayed with her in the hospital and visited the Chapel of the Sorrowful Mother often during that anxious time. 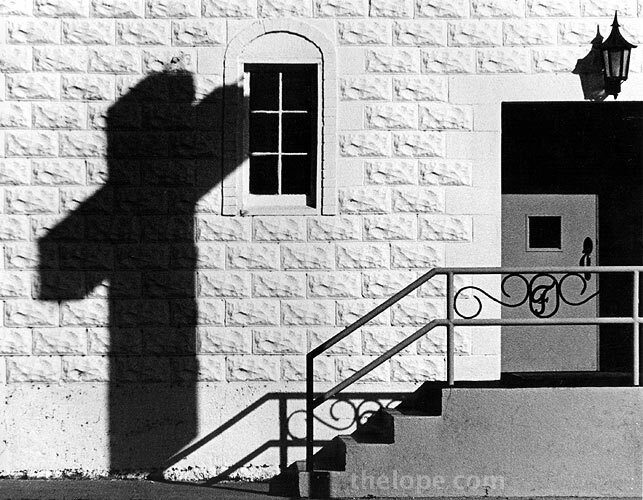 Happy Easter, and please enjoy the hidden chapel.